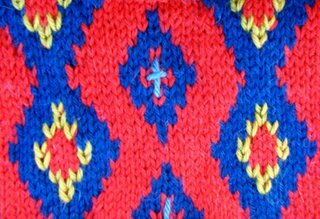 For years, I have designed lots of colorful knitwear patterns. 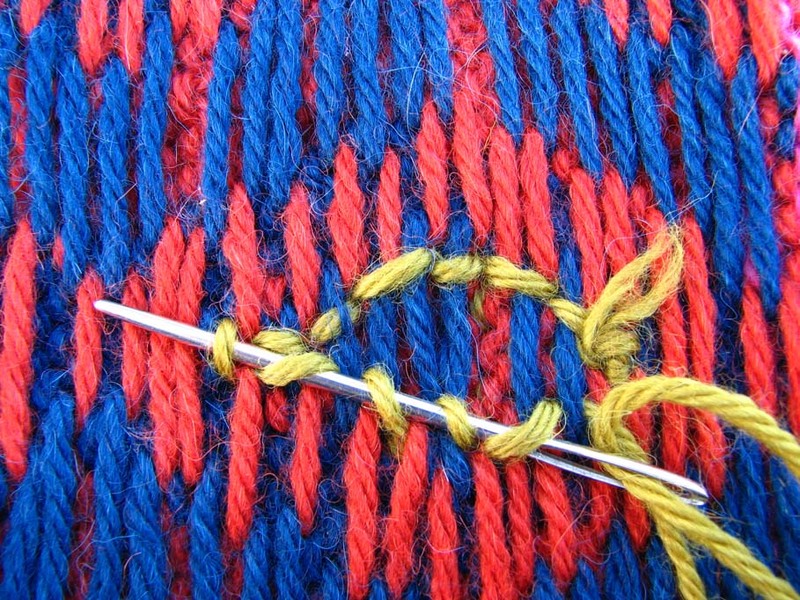 But since I'm the kind of knitter who likes to knit in the round, I can honestly say I have never knit anything but a swatch in the intarsia technique. Although I prefer colorful knitwear, I only like knitting with two colors at a time. I keep one in my right hand, one in my left and happily knit along following a chart. I even like to make my swatches on double points in the round with a steek and then cut them. That's what I did with this swatch which was how yesterday's cardigan began. 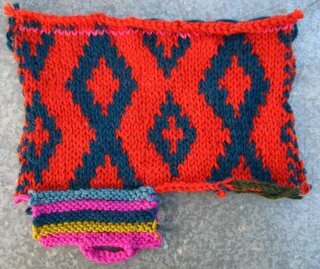 I knit the swatch, cut it and then added the striped trim so that the woman who was going to actually knit the sweater (one of my fabulous knitting pals - the famous Jeanne Moran) knew what the heck she was supposed to do. On the back, directly behind where my duplicate stitch is to begin, I take 2 small stitches into a small bit of the yarn (I usually split the yarn - this is a 3 ply so I stitched into just one of the plies). By doing this, nothing shows through on the right side. 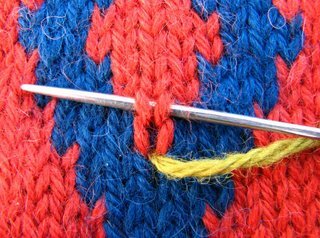 I use a blunt pointed tapestry needle - a sharp pointed needle doesn't work for me - it splits the yarn and slows me down. Next, I come up to the front of the stitch through the bottom opening of the stitch I want to cover. Then using my tapestry needle, I follow the legs of the stitch where they loop through the stitch above it. 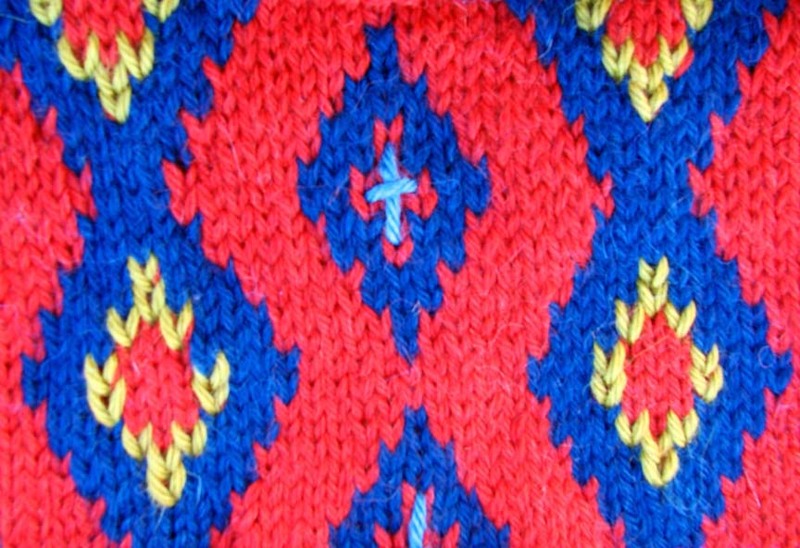 Then I go back down where I came up in the bottom part of the stitch. 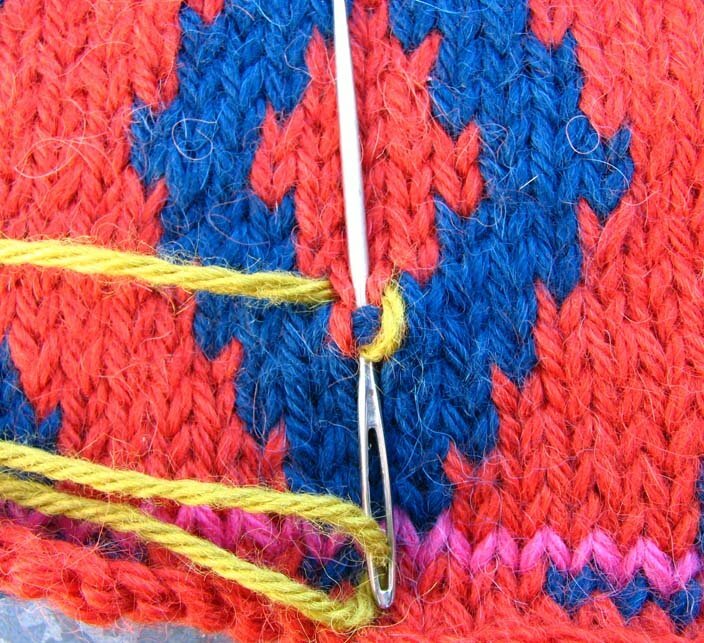 At the same time I poke the needle into the next stitch opening I am going to cover. I keep stitching, always working from the right side of the fabric until all the stitches are covered. On this fabric, I decorated the inside of the diamond with chartreuse to add a new color to the fabric and create some more visual excitement. I stitch loosely so that the fabric isn't distorted. 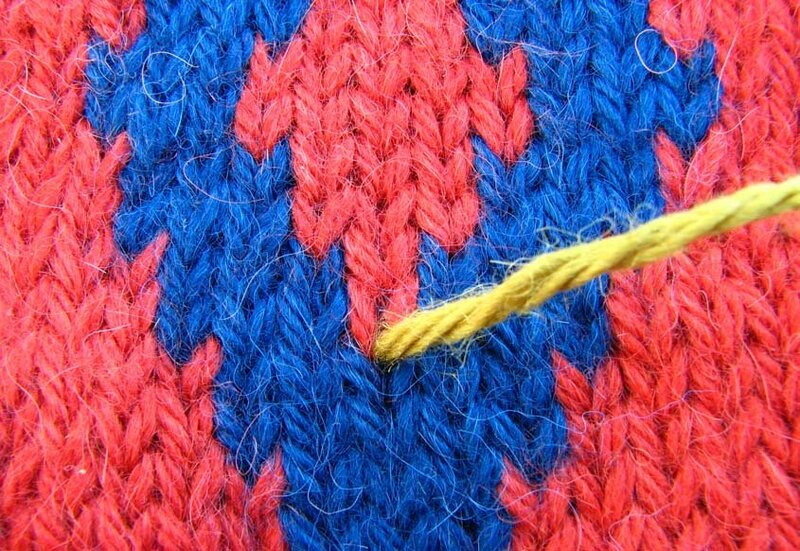 I don't worry if the stitches aren't covered perfectly - to me it makes the fabric more interesting if a little of the original knitted color shows through. I bring the needle to the backside and then I weave the needle through the back of the stitches to end off. I clip the thread leaving about 3/4 to 1". I prefer leaving a longer tail so that it won't pop through to the right side - even after several years. Here's what the finished fabric looks like after working all the large diamonds with Lady's Mantle and then adding some simple cross shaped stitches at the smaller diamonds in Blue Thyme Julia. 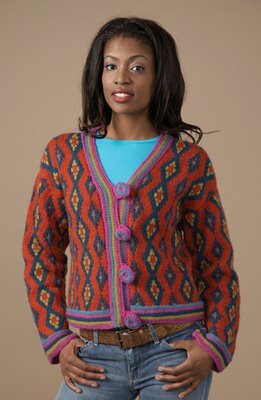 And here's what the finished sweater looks like. 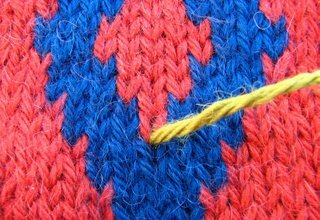 I think that for the relatively small amount of time duplicate stitch takes, it really adds a lot of punch to a finished design. 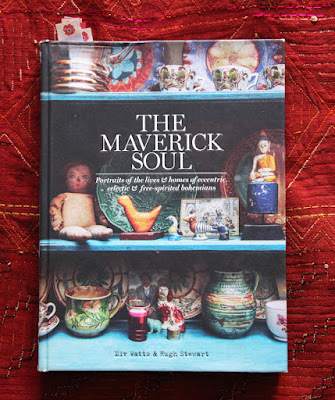 And I really enjoy doing it - it has a feeling similar to the rhythm of needlepoint. It's too bad that so many (all?) 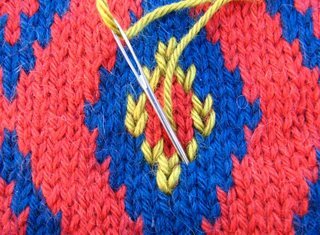 of your colorwork designs get published with instructions for knitting flat pieces -- they're clearly so much easier to knit in the round. Good to know you conceived of them that way, I won't ever hesitate for a second to turn one of your designs into circular knitting again. Not that it stopped me before, but I did hesitate for a nanosecond. Thanks for this tutorial! 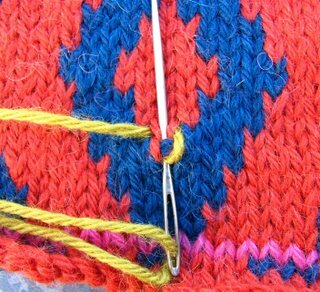 I really completely absolutely hate intarsia, so this is good stuff to know! 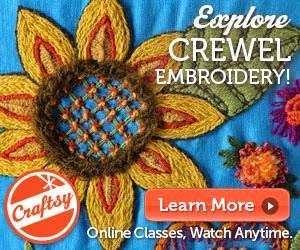 Thank you for the effective tutorial on duplicate stitch. It was very helpful to me with my project. 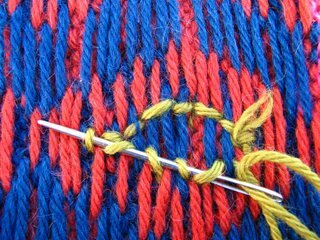 I'm not a knitter-with needles-anymore due to partial paralysis in my left hand. 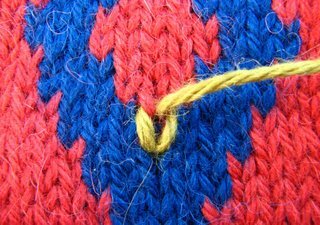 But I do crochet-and I love tunisian and bavarian crochet, and this tutorial will work with crochet also! 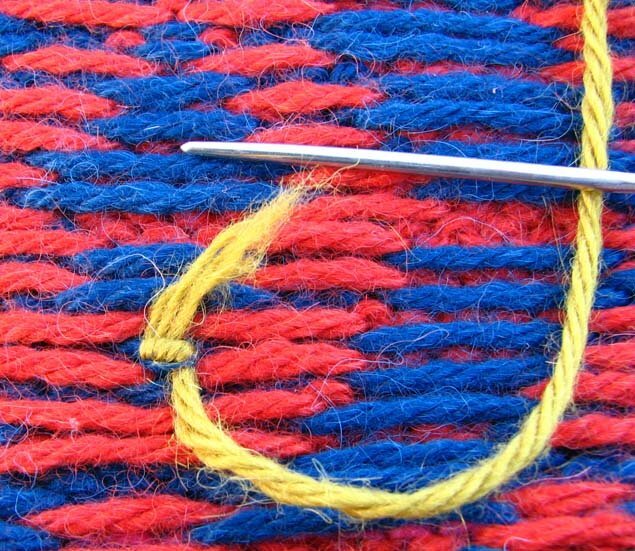 What a simple yet fantastic way to add extra appeal to any item that is made with yarn. Thanks for the fantastic tutorial!! !